The nonprofit youth literacy and advocacy organization Urban Word N.Y.C. and New York University’s Steinhardt School of Culture, Education and Human Development kicked off their annual Pre-Emptive Education Conference by showcasing a series of young poets who were joined by adult panelists at the university’s Kimmel Center. The weekend-long conference included a series of workshops celebrating the use of spoken word poetry and hip-hop as a means for young people to heal, educate and advocate on behalf of others. According to Urban Word N.Y.C.’s executive director, Michael Cirelli, the organization has worked with more than 16,000 students in 112 public schools, promoting literacy through college preparatory programs and by forming partnerships with universities to provide full-ride college tuition scholarships. It was Urban Word’s fifth year collaborating with N.Y.U. for the Pre-Emptive Education conference. Mariko Osanai cupped her cell phone away from her mouth and whispered “Just one second, I’m on the phone with my sister in Japan – there’s been another big earthquake, and they’re having a blackout. Can you believe it?” She shook her head, visibly upset, and stepped outside Dlala salon on Avenue A to smoke a cigarette, taking deep drags and pacing as she listened to the news. Weeks after the earthquake and tsunami that devastated Japan, Ms. Osanai, like many other Japanese living in the East Village, continues to spend much of her time on the phone, reaching out to friends and relatives from the hard-hit coastal regions. But for Ms. Osanai and a handful of Japanese East Villagers, making phone calls is not enough. A group of local Japanese artists have designed a logo – emblazoned with the words “Love Save Japan” in capital letters – to draw attention to the crisis in Japan and which has already helped raise thousands of dollars for the relief effort. 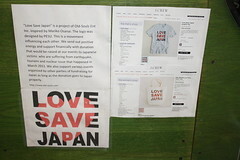 You may have seen their logo “Love Save Japan” on local storefronts or on flyers for live art events, or maybe on the latest J.Crew t-shirt(whose proceeds are all entirely donated to Japan relief). When Mariko Osanai, a hairstylist at dlala salon on Avenue A, called up her friend and artist PESU from down the block and asked him to design a graphic for her flyers, she didn’t know that the image would travel so far, or even beyond the village. What she and PESU (an illustrator and graphic artist also known as Naito Yushi), President of Old-Soulz Entertainment Firm Yaz Higashiya, his business partner Akimasa Koketsu and their collaborators have done is a substantial “something” — they’ve raised about $8,000 so far for Japanese charities, with two fundraising events each week showcasing urban art and music. DJs spin at local venues while PESU performs live illustrations. “You know, we’re not politicians or anything,” said Ms. Osanai, “but as musicians, artists, performers,” she hopes to make an impact. The day after Ms. Osanai began posting the flyers, she received a call from Jcrew, inquiring about the logo. “I think New York is amazing,” she said in response to all the interest and outreach Love Save Japan has generated, and the eagerness of New York artists to get on board. They don’t sit in the dentist’s chair, but they do lie on the table. The Local paid a recent visit to St. Marks Veterinary Hospital to watch animals undergo dental work, from x-rays and blood-work to cleanings and extractions. Though some dental tools are similar to a human’s, animals are put under anesthesia to be treated, and are sometimes covered in blankets to prevent hypothermia as their heart rates change. It’s a complex process, but an important step in preventing serious damage to the kidneys or heart. If a pet has bad breath, trouble eating, or excessive drooling, it may be time to book a dental.